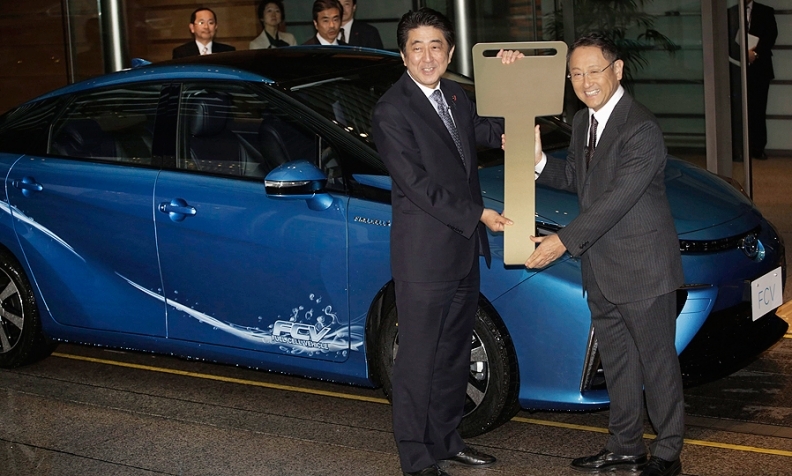 Japan's Prime Minister Shinzo Abe receives a commemorative key from Toyota President Akio Toyoda in front of Toyota's first commercial fuel cell vehicle during a ceremonial test drive on Thursday at the prime minister's office in Tokyo. TOKYO (Bloomberg) -- Japan will introduce self-service hydrogen filling stations and ease other regulations related to fuel cells to promote the technology, which carmakers including Toyota are using in vehicles. He didn’t give a timeframe for the self-service stations or elaborate on plans to relax rules. The government is planning hydrogen distribution facilities as it supports Toyota, which pioneered hybrid vehicles, to help popularize what the carmaker sees as the next generation of auto technology. Abe has said Japan intends to create a “hydrogen society,” with cells powered by the element also powering homes and office buildings. Fuel cells are environmentally friendly because they convert hydrogen to electricity, leaving only water vapor as a by-product. Toyota received about 1,500 Mirai orders -- 60 percent of which are from government offices and corporate fleets -- in the first month, as opposed to its target of 400 by the end of 2015, the carmaker said. The company is considering increasing production to keep up with demand, President Akio Toyoda told reporters at the prime minister’s residence. Early buyers of the car will be entitled to about 3 million yen ($25,500) in subsidies in some areas in Japan, government officials have said. The Mirai, which went on sale last month, is priced at 7.24 million yen in Japan before the government payment. Japan’s fuel-cell subsidies are bigger than the incentives that China, the U.S. and Europe are offering for electric-vehicle buyers. They are also more than triple the 950,000 yen of incentives Japan offers buyers of Mitsubishi Motors Corp.’s all-electric i-MiEV, for example.